The Primate of all Nigeria Anglican Communion, the Most Rev. 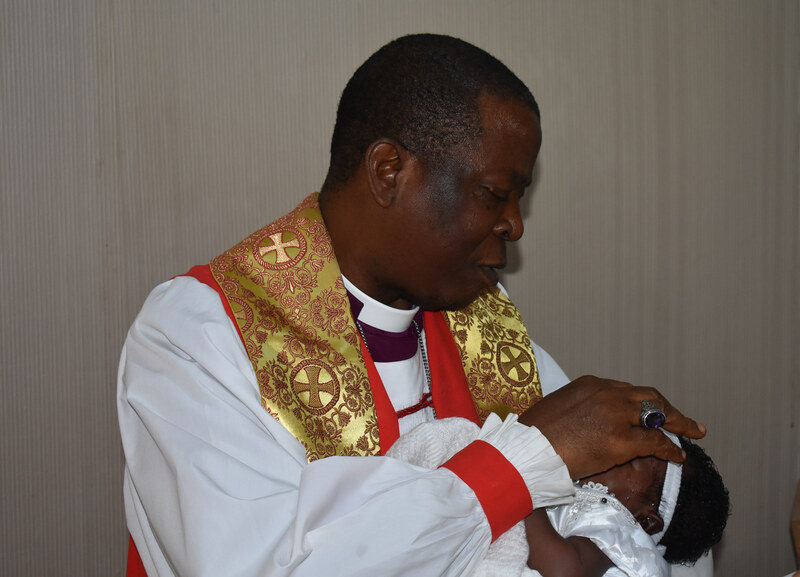 Dr Nicholas D. Okoh has emphatically stated that it is appropriate to take steps to bless a child spiritually through baptism, a rite of initiation into the body of Christ that is intentionally designed to have some water to symbolize cleansing and purification. 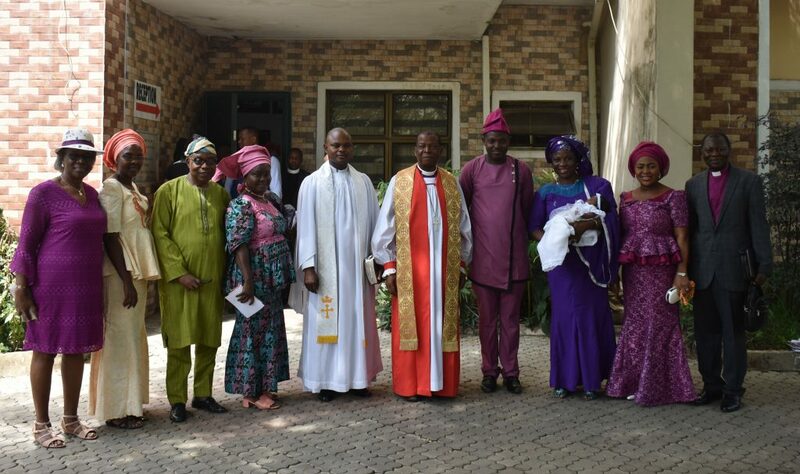 He gave this emphasis at the Baptism of Oluwatobiloba Oluwadarasimi Deborah Akintunde, daughter of the general manager of the Anglican Cable Network Nigeria (ACNN TV), Engr. Korede and Mrs. Akintunde, which took place at the Chapel of the Advent Episcopal House, Abuja. The Primate observed that many young people today experience challenges, because some new generation Churches have made them to believe that the only authentic method of baptism is that of immersion (to deep the individual into a pool of water). He debunked this belief, pointing out that water is simply used as an element of cleansing and its quantity cannot affect the baptism being done. He charged all present not to allow anyone deceive them into believing that infant baptism is not authentic, because the child is unaware of what is being done; adding that if the argument is that one should wait until the child is grown, why then the need to take other decisions regarding the child, such as the child’s dressing, name, school, on behalf of the child. According to him, if one has taken the good decision to clothe the child, one should also take the good decision of baptizing the child into the body of Christ. He narrated the story in the Bible of Jesus and the little children that He asked to be brought to Him, stating that Jesus did not only bless them, but commended their child-like character, which He described as the example for those who would enter the kingdom of God. He said Jesus welcomed the children even when the overzealous disciples tried to hinder them, showing that God recognizes children and supports the decision to engraft them into the body of Christ. Thus, he said the child who had just been baptized, has now been engrafted into the body of Christ and her heart has become circumcised. Primate Okoh explained the importance of child baptism, pointing out that it is vital that a child grows up as a balanced individual, nurtured both physically and spiritually. He mentioned the role of the godparents of the child, noting that this responsibility cannot be ruled out, especially in today’s busy world. The head of the Anglican Church in Nigeria stressed that there is no new Christian faith, but that which the Church inherited and has passed on to generations. He said no person has his or her own individual faith, explaining that the faith of the Church is what a person believes and accepts to be called a Christian. Primate Okoh concluded his message, urging all to not allow anyone unsettle their faith with beliefs that are not founded in Christ and the faith of our fathers. Highpoints of the service of baptism was the naming of the child who had thirteen names by her godparents, the Most Rev. Emmanuel Egbunu and wife, Mrs. Abiodun Egbunu, Archbishop of the Ecclesiastical Province of Lokoja and Bishop of Lokoja Anglican Diocese and Mrs. Henrietta Taiwo, wife of the Ven. 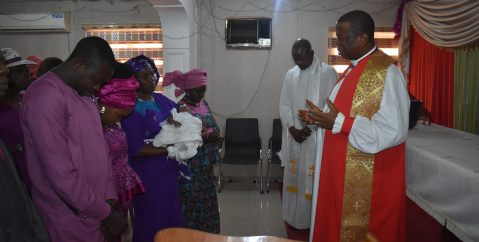 Foluso Taiwo, Director of Communication, Church of Nigeria Anglican Communion; the baptism proper, which included the sprinkling of water and blessing by the Primate; and thanksgiving offering to God for His gift and faithfulness. Also present at the service were some Priests of the Abuja Anglican Diocese, staff of the Episcopal House, Abuja, staff of the ACNN, the chairman of the ACNN Management Board, Sir Folu Olamiti, family, friends and well-wishers.